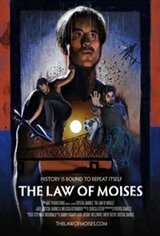 The Law of Moises is a family adventure comedy film about MOISES who since the death of his parents at the age of nine has only dreamt of one thing - getting out of Cairo, Illinois, a stifling 9 square-mile town, to make his own films that will change the world. Similar to his namesake - Moses 2,000 years earlier - our hero, Moises suffers from a speech impediment and anger issues. The similarities don't stop there - in the town, there seems to be BLOOD flowing in the Mississippi River. Other plagues follow, including frogs and locusts that aim to devour the town's historic landmarks.